……gOS Linux Community News, Projects, Development, Tutorials, Press & More. Netbooks sometimes offer resolutions that a normal desktop environment may not be the most efficient on. Fortunately a unique alternative exists that can be easily setup and used for launching applications and desktop management on your netbook. The gOS Netbook Launcher differs from its similiar counterparts in that it is to be utilized as an accessory to your normal gOS Gadgets installation. 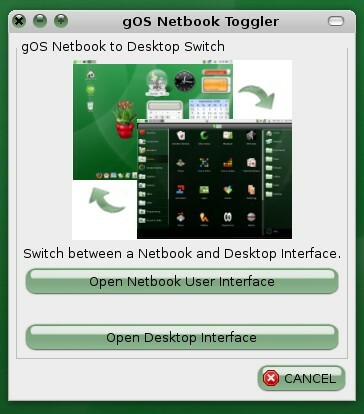 It includes a toggler/switcher which can be found in the Accessories menu which will allow to too easily switch back and forth between a Netbook UI and the default gOS Gadgets Desktop Interface. You really don’t even need a netbook to use it, it can be used just as well on any computer running gOS Gadgets. This Launcher is provided by the gOS Community and is not officially supported by Good OS for system manufactures. There are no bugs which will endanger your system, but you may encounter certain minor bugs in it. This utility is still very much under beta development. To install gOS Netbook Launcher make sure that you have the Gadgets repository added to your Software Sources. Then click the third party software tab and see if the following source is there. If not add it and reload your sources. Be sure too make sure your souces are reloaded and updated. Now you can either search for ume-switch-gos inside your Synaptic Package Manager or install it directly from your Firefox by copying & pasting the following line into the browser’s url field. This utility is not to be used alongside Compiz desktop effects as our tests of running it alongside Compiz has shown several very annoying bugs. To get the Launcher to begin at startup so you aren’t required to toggle too it then perform the following actions. Now find xcompmgr near the bottom of this list and uncheck it. Lastly, there are certain bugs which will be encountered when running desktop widgets like Google Gadgets alongside the Netbook Launcher. * Note: This is still very much beta software. You have been warned of possible problems and errors, so if you encounter them please do not report them to the gOS Support Channel at Google Groups. The gOS Netbook Launcher is a skinned version the ume-launcher provided by the Ubuntu Netbook Remix Team and includes toggler unctions not present in there version. The original source code can be obtained here. The toggler source code is present in the ume-switch-gos package. Become a member of our rapidly growing gOS User Community. Help aid in development, submit bugs, or just get some friendly general help with gOS Linux. Join the gOS Community Forums!